Paper Boat, 80ft loa, profile, plan and body section by George Wyllie, 1988. My first close encounter with the work of scul?tor (that’s not a typo), George Wyllie (1921-2012), was at Glasgow’s Gallery of Modern Art in the early 1990s. Navigating to the source of some hearty giggling where I’d once had to keep deathly silent (the gallery is housed in the former Stirling’s Library) led to his All-British Slap and Tickle Machine, a wonderful contraption installation replete with bicycle seat and operating pedals, a floppy leather slapping hand and a mannequin’s tickling finger. George Wyllie’s trademark question mark might have come in handy for one or two of the exhibits within that beautiful building, but definitely not for this mirth-inspiring item. It must have been pleasing to her designer that she sat so perfectly on her lines straight out the box – especially at such a public launch. Did you see the Denny Test Tank, Dumbarton, where yacht designer, G.L. Watson, broke new ground in running truly scientific model trials for Sir Thomas Lipton’s 1901 America’s Cup challenger, Shamrock II, and James Gordon Bennett’s remarkable steam yacht, Lysistrata? The white ship in the background as QM sails on the Clyde was one of the last to be launched by Denny of Dumbarton, in 1961: the turbine packet, Caledonian Princess… And the Port Glasgow timber ponds, where shipbuilding lumber was pickled before use. 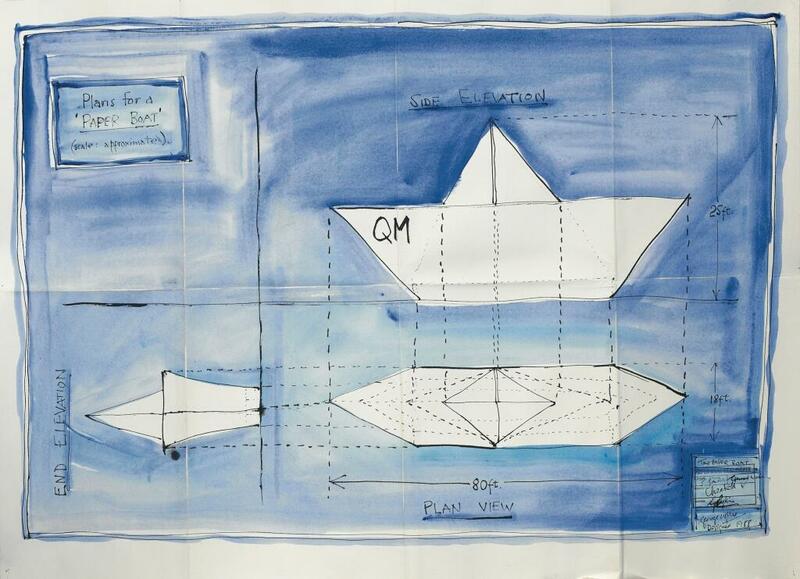 The name of George Wyllie’s paper boat, QM, of course raises more questions than one! During the 18th and 19th centuries, Greenock was one of Scotland’s most valuable wealth creating locations, and not just from shipbuilding. The sheltered west coast port was perfectly situated for transatlantic trade, especially the import and refining of sugar which ended in 1997 with the closure of the Tate & Lyle refinery. A movement of locally connected artists – the Absent Voices project – is now gaining significant attention for the long-term aim of converting the grade-A listed sugar warehouses at Greenock’s James Watt Dock into an amazing public space for the arts; perhaps even the idea of a “Tate Scotland”. Sugar refiner Henry Tate gave his name to the famous galleries. His refining business merged with Greenock born Abram Lyle’s in 1921 to form the biggest name in British sugar and sugar products. Tate Liverpool has already proven how well it can work with similarly striking dockside warehouse buildings. Martin Black’s biography, G.L. 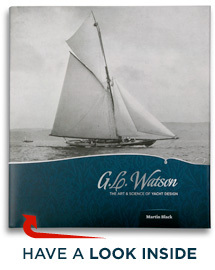 Watson – The Art and Science of Yacht Design, is one of the most lavish book productions ever to address the astonishing story of the marriage of art and science that was, and still is, Clydebuilt. This entry was posted in America's Cup, art, book, Clydebuilt, film, Firth of Clyde, G.L. Watson, gift, Glasgow, humour, object of desire, photography, River Clyde, ship launch, shipbuilding, shipyards, tank testing, yacht design and tagged Abram Lyle. paper boat, Absent Voices, Clyde-built, Denny of Dumbarton, Denny Test Tank, Finnieston crane, George Wyllie, Henry Tate, Lysistrata, Shamrock II, Stobcross crane, Sugar Sheds, Tate & Lyle, Tate Gallery. Bookmark the permalink.